The permaculture perspective that informs Urban Roots, a community farm and education center, allows it to be rooted deeply and reaching broadly. This year’s name change—the Access of West Michigan Walk for Good Food replacing the Hunger Walk—seeks to do justice to the diverse approaches of the Walk’s recipient organizations to fighting food inequality and pursuing a life-giving system of food. The mission and work of Urban Roots, a community farm and education center located in the Madison Square neighborhood, is rooted in the fact that food is linked to so much more than a full stomach. In non-profit work, a singular focus can reach broadly and deeply. For Urban Roots, a focus in urban agriculture is addressing not only hunger but patterns of systemic inequality in the food system. Maaike Baker, Community Engagement Manager at Urban Roots, stressed the importance of permaculture to the non-profit. Permaculture stems from the idea that human food systems can reflect the resilience and viability of natural ecosystems. Operating within a permaculture lens, Urban Roots works to create a more equitable system of food informed by its three pillar values: care for the earth, care for people, and fair share. Founded in 2013 by current Executive Director Levi Gardner, Urban Roots became a non-profit and moved to its current space in 2015. Working as both a community farm and education center, the organization utilizes its inner city plot of land to bring some of the most affordable organic, nutrient dense produce to the Madison Square neighborhood. 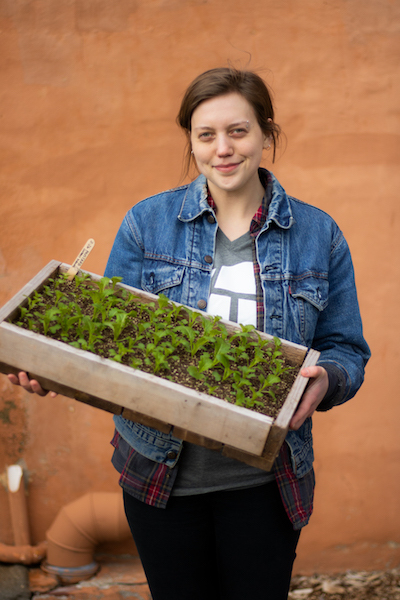 Urban Roots’ programs concentrate on connecting people to the soil and to the table. In addition to a community farm and produce market, they lead a series of gardening, composting, and cooking workshops. This education focus is also evident in Urban Roots’ mobile classroom, which takes the growing experience out into the community. “We come with the knowledge and the expertise and the tools and meet them where they’re at....What we do is really try to inspire them to have a community through food, a community through growing,” Baker states. The impact of Urban Roots’ programs are reflected in increasing growth, community engagement, and investment. For those who want to get involved, participation as a volunteer, workshop attendee, mobile classroom partner, or market-goer is welcomed and encouraged. Urban Roots also stresses the importance of placemaking in one’s own neighborhood. Community transformation can stem from conscious living in any area of life, and the organization’s approach to the need for good food demonstrates this commitment. With an intentionally specific focus on urban farming, Urban Roots flourishes in the space where it is planted, and reaches broadly.